NASFAA has created a toolkit of easily customizable letters and worksheets (all in Microsoft Word format) to help your manager understand the return they will see on this important investment. 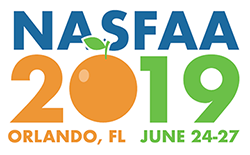 Now more than ever, the NASFAA National Conference serves to provide you with the training resources, political realities and advocacy pathways for student aid administration. Letter to your manager - Use this customizable letter template to help explain and justify your conference attendance to your boss. Benefits worksheet - Use this worksheet to create a custom list of the benefits you and your institution will gain from your attendance. Post-conference ROI worksheet - Use this worksheet to take notes on sessions, and record key takeaways, action items and estimated return on investment (ROI). These notes can be referenced in creating your post-conference trip report. Use these additional tips to make a strong case for your attendance.